For the 2012-2013 academic year, I was a fellow with the Cultural Heritage Informatics Initiative at Michigan State University and MATRIX. My introduction as a CHI Fellow is available here. For those interested in recent conversations in the digital humanities, see my summary of THAT Camp Caribe. Settlers “moving through space and exercising an inherent sovereign capacity” were the driving force behind settler colonization and the dispossession of the Indigenous population in places as varied as New Zealand, North America, South Africa, and French Algeria. Settler colonialism’s legacy continues to influence geopolitics, national policy decisions, and people’s daily lives. Hence, the formation and structures of settler colonialism are essential to understanding not only a widespread phenomenon foundational to many contemporary societies, but also to uncover a holistic knowledge of empire, settler roles, and Indigenous actions within colonial contexts. This knowledge is especially important in modern settler societies where settler colonialism is no longer visible but perceived as “normal.” To deconstruct settler epistemologies, my project will expose and make comprehensible for the general public the processes and institutions of settler colonialism, as well as Indigenous influences on their form and limits in the French Algeria (and eventually the American Midwest). As a Cultural Heritage Informatics fellow, I am developing “Settler Colonialism Uncovered,” a series of online exhibits to demonstrate where, how, and why settler colonies developed in the two locations mentioned. This site is designed for high school and undergraduate students and educators, as well as early-stage researchers and the general public. It allows (or will allow through ongoing development) users to explore the historical geography, landscapes, and demography of settler colonies as they changed over time and how settlers, administrators, and Indigenous communities experienced the changes wrought by conquest and settlement. It is also my desire that this site will become a repository for other researchers to share their findings and for Indigenous communities to share their own histories from the colonial era(s) from their perspective and in their own words. Using Omeka with the Neatline plugin suite, each exhibit interface is (and will be) an interactive temporal map of the focus regions that links to additional maps, paintings, sketches, photographs, primary documents, and a narrative to contextualize the objects in the exhibit and use them to tell the story of colonization from multiple perspectives. Additional primary sources may include news articles, treaties, transcribed speeches, correspondence, and selections from military reports and memoirs. Thus, this project will present the story of settler colonialism as it unfolded in two significant regions from diverse viewpoints to encourage users to think critically about the past, especially that which feels most familiar, and develop informed perspectives about present socio-political debates. At its most simplistic, settler colonialism was (and is) a process in which emigrants move(d) with the express purposes of territorial occupation and the formation of a new community rather than the extraction of labor or resources (however, these may have been or become secondary objectives). An integral part of this process was and is Indigenous dispossession and elimination through various means. These practices and their impact have important legacies and implications today but are often glossed over in most secondary history curricula and are practically unknown among the general public. For this reason, the processes of settlement and Indigenous dispossession will be the focus of this project. Despite the steps many Western societies have made toward recognizing and addressing injustice in present settler colonies – including the United States, Australia, Canada, and New Zealand – and former settler colonial metropoles, such as France, education about this topic is rare, controversial, and often meets with white resistance. In the United States and elsewhere, educators face the additional problem of access to the resources needed to guide students through an inquiry-based study of colonialism more broadly or settler colonialism specifically. Although sites such as the American Memory Project through the Library of Congress and Yale’s Avalon Project have done an excellent job making a number of primary documents related to Native American history available, there remains a gap in the available resources. What instructors need is a site that integrates Indigenous and/or colonial history and the national narrative, situates the region of interest in the wider lens of settler colonialism, contextualizes the primary sources presented, and allows students to examine events from multiple perspectives and compare them to events and experiences in other settler colonies. These, then, are the objectives of this project. As previously state, this project is meant for high school and undergraduate students and educators, early-career graduate students, and amateur historians interested in local histories of the locations highlighted. It is also intended to eventually provide a repository for other scholars who wish to share their research on settler colonialism (which may include text sources, such as military records, land negotiations, treaties, newspaper articles, petitions, oral histories, and visual records) with a broader audience. This project needs to be easily accessible to students, teachers, the general public, and international scholars, so it must be available online. With Omeka 2.0, the platform features themes that are accessible on mobile devices (tablets and smart phones) for students in and out of the classroom and for researchers who would like to upload their recorded oral histories, photos, notes, and transcriptions from the field. The only platform with the capabilities I wanted for this project was Omeka with the Neatline plug-in suite. Omeka is web-publishing platform designed by the Center for History and New Media (CHNM) at George Mason University that functions as an integrated digital collection, content management, and exhibition system. One of its primary advantages is the robust nature of the metadata one can include for each item added to its database. 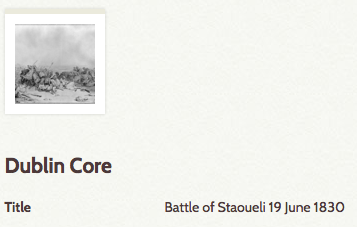 Additionally, teachers and professors can use the site to create lesson plans, inquiry-based assignments, and facilitate discussion as students explore the site and accompanying primary sources. I chose to work with the recently released Omeka 2.0 version because of its user-friendly interface and greater flexibility and extensibility. Furthermore, since some of my exhibits feature North Africa, I wanted a platform that allowed for non-Roman characters and displayed them correctly online. While I have not yet incorporated some of my Arabic sources into current exhibits, I plan to do so in the future. These will then be transcribed in Arabic and translated into English. The Neatline plug-in suite for Omeka is especially well suited to the goals of this project. Included in the 2.0-compatible suite are NeatlineFeatures, NeatlineSimile, NeatlineTime, and Neatline Waypoints. (A brief description and example of each follows.) Together, this suite functions as a geospatial exhibit builder with a temporal component built in that allows one to develop interactive contextualized representations of the past that bring archival collections to life through maps, nuanced timelines, and embedded primary sources. 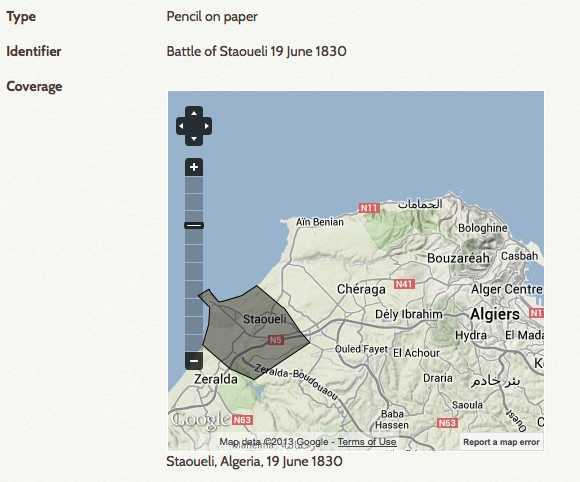 Neatline Features: Admins can draw shapes and highlight points on maps and link them with an Omeka item. 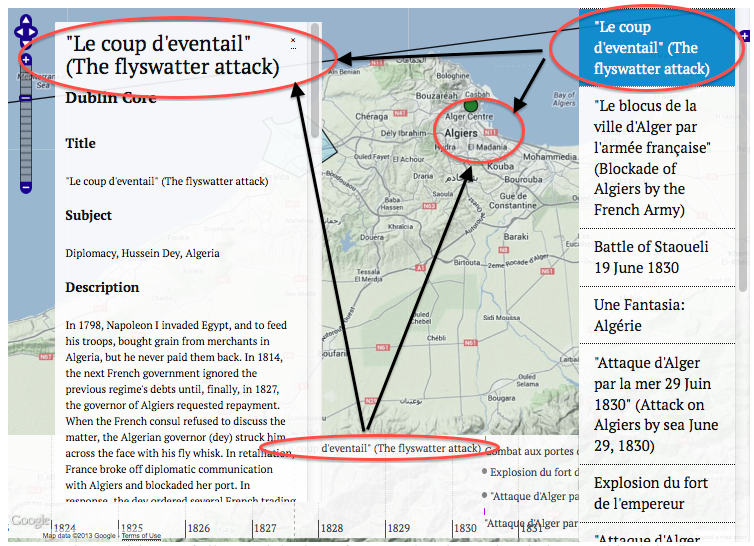 This plugin also adds geospatial coverage to Omeka items. Until I create a geo-referenced historical map for the interface, I am using a Google map with physical features as well as city and street information. For instance, this item (left) is linked with the geographical information and map (right), with the region of Staoueli outlined. Neatline Simile: Neatline Simile makes it possible to add the SIMILE Timeline widget to Neatline exhibits. Once the timeline has been added, records can be plotted as points and spans on the timeline, and the timeline can be used to control the visibility of records on the map (and in other viewports added by sub-plugins, like the Waypoints list). See the example to the right. 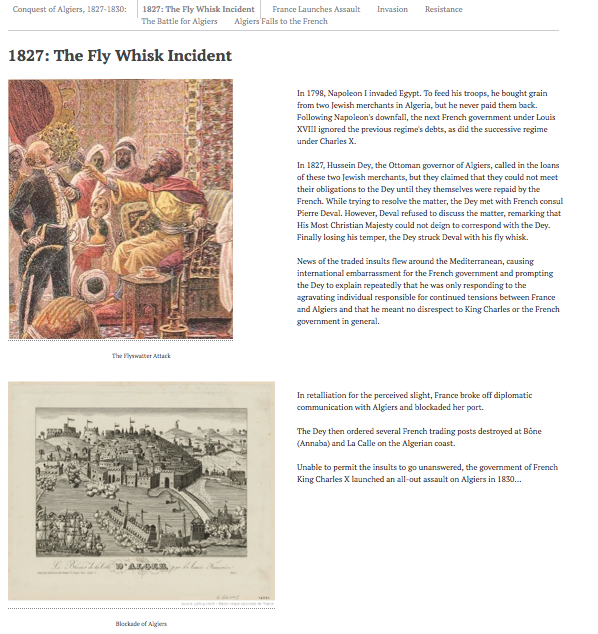 Neatline Time: This plugin creates a standalone timeline with selected items in Omeka. However, the problem with this plugin for my purposes is that it creates the timeline based on the information input into the “Date” field in the metadata, which is the date of creation rather than the date of the event depicted. On the other hand, if one were interested in comparing the date of creation to the date of the event depicted, this may be a useful visualization of the data. Using Omeka, I have created two different types of exhibits using the same set of sources in two different ways. One exhibit embeds the maps, paintings and sketches into narrative text that describes the precursors to, and the French conquest of, Algiers in 1830 from both French and Algerian perspectives. This problem should be addressed when the NeatlineText plugin becomes available. Neatline Dilemmas: Neatline is a powerful display tool, however, there are a few problems with it. When clicking through the sources, the digital objects that the creator is trying to highlight appears at the very bottom of the metadata, and the panel of metadata covers the map display and the timeline. A similar problem exists with the timeline – it covers part of the map and makes it difficult to interact with either one. Add more source material from French and American archives and build additional exhibits with this material. The next two exhibits to be built focus on the conquest of the Algerian province of Constantine, 1836-1837, and the Algerian resistance movements led by Hadj Ahmed Bey of Constantine in the East and Abd al-Qadir in the West. Add lesson plans for instructors wishing to use these exhibits in the classroom. 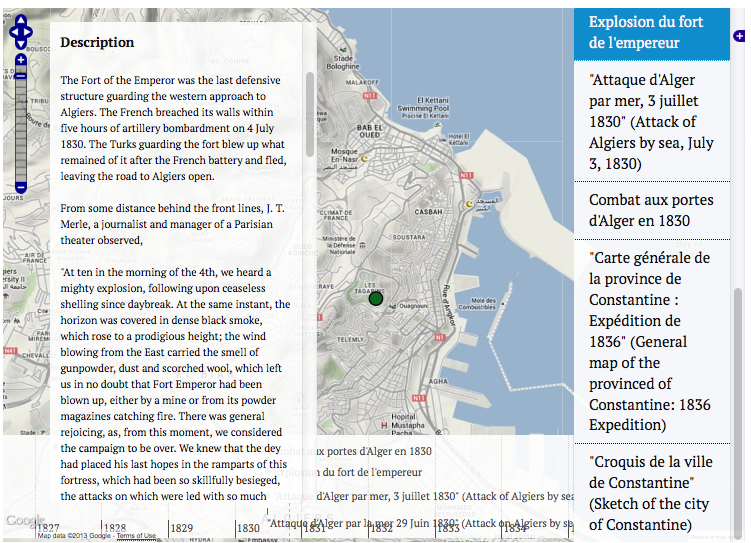 I will use GeoServer to create geo-rectified historical maps for the interface of each Neatline exhibit. Design my own theme that will include changes, such as making the site navigation sidebar on the left side of the screen smaller to allow more space for the map and metadata panel in Neatline exhibits. Define the element set by annotating metadata to clarify for other researchers and site-contributors what information should be included in each metadata field. 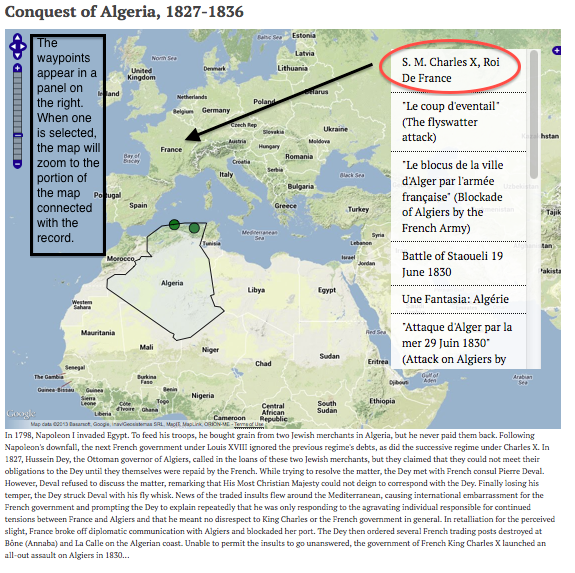 Thus far, I have created a prototype with one location and set of sources – French Algeria, 1830-1837 – that will serve as a model for others. In the future, I would like to continue to develop more complex maps and add additional locations and people groups to the site, as well as learning activities and guides for high school teachers and professors, and information that would be useful for amateur historians and genealogists. Over the next two years, I plan to develop contacts with historians, archivists, librarians, anthropologists, other interested scholars, and Indigenous leaders both in the United States and in Algeria. Over the next couple of years, I will also investigate other funding avenues for this project and would like to build a team of scholars who study settler colonialism and/or are involved in the digital humanities as researchers, educators, or IT specialists to take this project to the next level. To foster the development of this collaboration, I am creating a professional network on H-Net, H-Settler Colonial, for scholars to share ideas, resources, book reviews, lesson plans, and to facilitate discussions around this new and growing sub-field. Adam Barker, “Locating Settler Colonialism,” Journal of Colonialism and Colonial History 13, no. 3 (Winter 2012) http://muse.jhu.edu.proxy2.cl.msu.edu/ (accessed December 10, 2012). Colonial Frontiers: Indigenous-European Encounters in Settler Societies, Studies in Imperialism (Manchester ; New York: Manchester University Press ; Distributed exclusively in the USA by Palgrave, 2001), 2. Lucy Murphy’s A Gathering of Rivers: Indians, Métis, and Mining in the Western Great Lakes, 1737-1832 (Lincoln: University of Nebraska Press, 2000) and David Prochaska’s Making Algeria French: Colonialism in Bône, 1870-1920 (Cambridge, UK: Cambridge University Press, 1990) offer examples in which extractive colonialism through mining operations was combined with settler colonization in each location. For the case of Canada, see Carol Schick’s recent article “White Resentment in Settler Society,” Race, Ethnicity, and Education (2012) on teaching about the history and culture of indigenous populations and the impact of settler colonialism on these communities in Canada. For the January 2012 controversy over Arizona’s ban of the Mexican American Studies curriculum and numerous books that presented Indigenous perspectives, which “are too often silenced in the traditional curriculum,” see: ICTMN Staff, “Shakespeare and Native American Authors Among Those Banned from Tucson Schools,” Indian Country Today (January 16, 2012). For the 23 Feb 2005 French law that mandated that teachers must present the history of French colonialism in a positive light, see Jon Henley, “French Angry at Law to Teach Glory of Colonialism,” The Guardian (Friday, April 15, 2005).